On our Surface Book: Google MyMaps to the left and TripIt to the right. While making travel plans for our upcoming holidays, we found it a hassle to make plans and find booking confirmations through a series of WhatsApp conversations and emails. 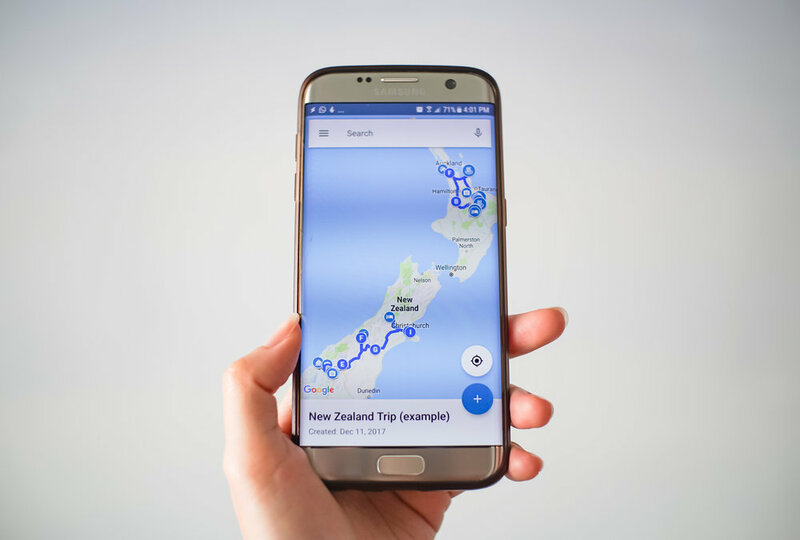 In our search to find a smarter way to make holiday plans, we discovered TripIt and Google MyMaps - which are 2 cross-platform services that bring a lot of convenience to planning an itinerary. These apps, which are accessible from any internet browser, or as iOS or Android apps, also act as helpful visual references. TripIt and Google MyMaps are cross-platform services - to the left is the TripIt Android app, to the right is the Google MyMaps app. Here's our quick review below! (And you can read how we used these apps to plan our holidays here). TripIt works as a mobile app too (pictured here on an Android phone). While searching the internet for a cross-platform app/service that allowed for easy holiday-planning, we stumbled on TripIt. It works on any web browser, and also has iOS and Android apps. The TripIt landing site/dashboard shows a quick summary of your upcoming travel plans. TripIt allows you to create a timeline of planned activities on a trip overseas. You can create plans for lodging, activities, directions and flights. Using these functions, you can roughly create an itinerary for your holiday. For greater precision in planning your holiday, you can then add directions - just provide the address of your expected location and destination (e.g. from hotel to airport), and TripIt will provide directions (from Google maps), as well as an estimated time of arrival. This helps in planning the time you should leave and is really helpful (especially when you're overseas and unsure). These directions can be for bicycling, driving, walking or via public transport. TripIt allows you to conveniently add directions between destinations. What's amazing is that TripIt also pulls details from your booking confirmations in your gmail inbox and accurately creates these plans for you in the timeline. It's smart enough to piece together all these separate plans into one itinerary for your holiday/trip. 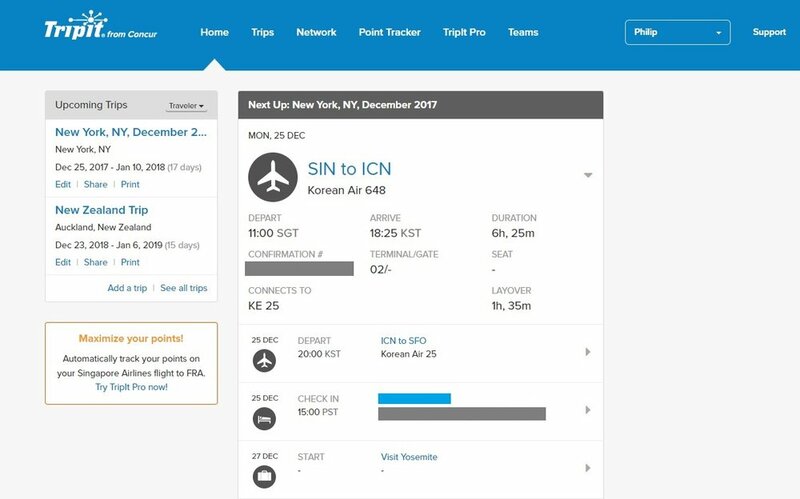 Alternatively, you can forward your email booking confirmations to TripIt (at plans@tripit.com) and it'll automatically generate a plan for you within your trip. TripIt is able to accurately pull booking confirmation details from your emails. The way this works is quite amazing because TripIt is able to pull additional details about your flight (airport terminal for arrival and departure, the relevant times of arrivals/departures/connections etc. ), lodging (like location, check in and check out timings, phone numbers etc. ), activities (like venue, timings etc. ), restaurant reservations, transport arrangements etc. An example of the TripIt timeline of plans (for your travel itinerary). TripIt is also able to detect "conflicts" in your plan (when flight numbers or timings defer, or when plans clash with each other). You can then decide how to resolve the conflict. Using these tools, it's very easy to create a planned itinerary, whether detailed or not. The best part is that once you've actually booked the lodging/flight etc., TripIt will merge the confirmation details into your plans (including booking numbers) and you have a finalised itinerary for reference. Note on TripIt Pro: TripIt is a free service and works well without having to pay a cent. But it also has "premium" features that you can pay US$40/year - these help you track your flights and frequent flyer miles, among other things. The feature to update you whenever there's a change in flight timing or terminal etc. appears especially helpful. But, frankly, US$40/year is exorbitant and unless you're a frequent flyer planning work trips all year round, I wouldn't recommend paying for the service. The Google MyMaps app on an Android phone. Google MyMaps isn't quite as detailed as TripIt when it comes to planning a holiday. Where it comes in helpful is in visualising where you want to go (especially if it's a road trip). A note on Google Trips: Google also has an application with similar functionality to TripIt, called Google Trips. Although Google Trips can automatically scan through your emails to create an itinerary for you, we didn't feature Google Trips here because it doesn't work quite as well as TripIt (at least for now). First of all, Google Trips exists only on an Android app, and can't be accessed from a browser. Second, you have less granular control over your plans. TripIt lets you easily add details about lodging, activities, directions etc. Google Trips' automatic scanning of email also (rather surprisingly) doesn't work quite as well as TripIt's algorithms. Where Google Trips shines is in integration with other Google services. So, for example, it's much more intuitive to find related booking emails for your flight in Google Trips. Google Trips also has an "offline guide" feature, which downloads information about places of interest, transport, discounts etc. related to your trip. If you're interested in these automatic functionalities you can check it out here. Google MyMaps is like an extension of Google Maps. It has access to Google's entire database of locations, hotels, activities etc. You can easily search for a point of interest and apply a pin (called a "marker") to the map. You can search for points of interests, landmarks or other destinations in Google MyMaps and add them as "markers", either for reference or for adding "directions. You can then label the pin accordingly (and even change the pin icon and colour) for easy reference in the future. One of the more helpful features is also the ability to create "directions". With this, you can easily see where you're headed between points of interest and very roughly gauge distance. You can add directions in Google MyMaps, and a route will be mapped out for you in sequence. You can change the route by dragging it. Here, you can see the route from Taupo (C) to Rotorua (D). However, Google MyMaps is limited in that you can't actually get turn-by-turn GPS directions from MyMaps itself. In fact, there's no link to Google Maps to get those directions. You'll have to manually open Google Maps and key in the directions to get turn-by-turn GPS directions, which is a hassle. This notwithstanding, you'll find that you'll naturally want to look at Google MyMaps over TripIt when you need a quick reference for your itinerary. This is because the visual nature of MyMaps (which conveniently shows your landmarks/directions) allows you to quickly find out where you'll be doing something. You can edit the "title" and "notes" for each marker to include additional details, or change the name (and icon) of the point of interest altogether. In addition, if you edit each landmark to manually state the dates you intend to visit the landmark, it's a quick and easy reference when you'll be doing that. We show you in greater detail how we used TripIt and Google MyMaps to plan a holiday in this article. Once you've used these free services, you'll find yourself really appreciating the convenience and utility when creating your travel itineraries. You'll find yourself using TripIt and Google MyMaps while planning your holiday, and when you've actually embarked. When doing pre-planning, using TripIt and Google MyMaps are a convenient drawing board for planning the "skeleton" (or framework) for your itinerary. With this framework (which you can easily change around as you do more research and change your plans), you have an easy point of reference when looking at activities and accommodation. This also helps when you start making your bookings, because it's easy to refer back to your itinerary on either TripIt or MyMaps to see if you've missed anything out. And of course, when you're actually on your holiday, the information stored offline in TripIt will come in handy whenever you need details about your flight, accommodation or activities (conveniently stored in one place!). Do we enjoy the smart life with this? Yes, using these smart services save a lot of time and help us make sure we don't miss anything out. Who should use this? Anyone who is planning a holiday (with a detailed itinerary). Who shouldn't use this? Anyone unfamiliar with using smartphone apps and prefers hard copy documents.